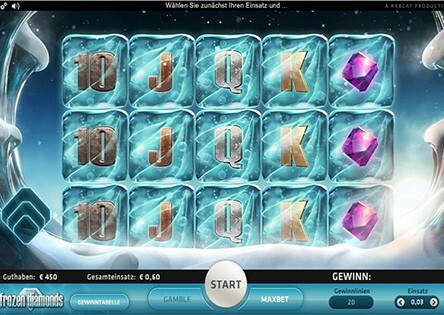 Frozen Diamonds is a 5-reel, 20 payline, online video slot machine powered by Microgaming. It has a wild symbol, collapsing win lines, free spins with 2-3 placed wilds every spin and a gamble game. The game is driven by falling win symbols instead of traditional reels. This surprising 5 multi-line game offers a lot of winning opportunities due to the extra Bonus Falls, Free Spins feature and the cool Gamble Game. Trigger the fantastic bonus and win up to 10 free spins, including 2 to 3 wild symbols. This fascinating game will take you to a new world of incredible features, visuals and a great overall experience. The Free Spins Feature/Bonus Falls, is triggered when 3 consecutive wins are achieved, and awards up to 10 Free Spins with 2-3 wilds on the third reel. The indicator will fill up with each win that you achieve until the Free Spins are triggered. You will receive 1 Extra Free Spins whenever you manage to complete 3 consecutive wins during the Bonus Falls feature. And the best part, during Extra Free Spins, every win is doubled!